The people who built the railways of early Canada did more than simply lay railway tracks — they helped to build this country. For those of us with railway workers in our family histories, their stories stretch beyond sentimental journeys, even as we look back with pride on our ancestors’ industry and accomplishments. My family’s railway history courses through the lives of several McKinnon men — Allan, his son Angus Archibald, and his grandson Harold Archibald — and their respective wives, Ann, Sophia, and Emma. Allan McKinnon left Tiree, Argyllshire, Scotland, around 1830, bound for Nova Scotia. Settling in Cape Breton, he made a home at Dunakin, Inverness, located just up the hill from the MacLean Church at Stewartdale. During a trip to Cape Breton, we met up with researcher and historian James St. Clair, who told us that Allan likely helped to rebuild the MacLean church. St. Clair also shared land deeds that revealed more information about Allan and his wife, Ann, who was born in Port Hastings, Nova Scotia. After mortgaging their property in 1860, the couple moved to Petitcodiac, New Brunswick, appearing in the 1861 census for that region. By then, the census tells us, they had a son — my great-grandfather Angus Archibald, age one. 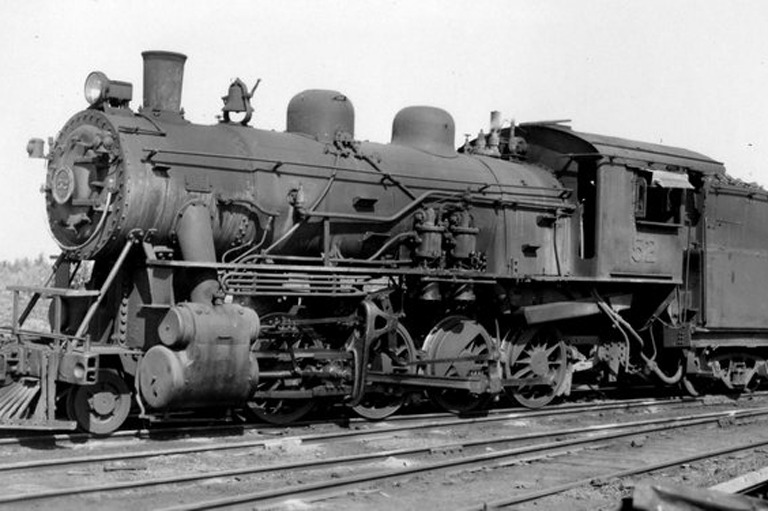 Allan found work as a railway labourer on Maritime tracks, including for the European and North American Railway that ran through New Brunswick and Maine. The family moved back to Nova Scotia in the mid-1860s and by 1871 was living in New Lairg-Lansdowne area. Sadly, the family entered a period of tragedy: Daughter Flora died of brain fever in 1872, and her older brother Lauchlin, sixteen, died a year later, just two days after mother Ann had delivered a baby son. The family chose to name the new baby Lauchlin, after his older brother. Sadly, between March and August of 1880 Allan and Ann lost three more children, including young Lauchlin. 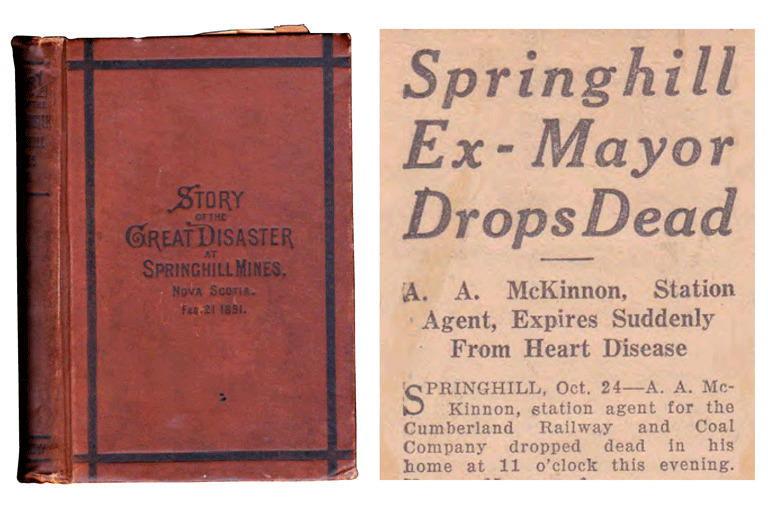 Book titled Story of the Great Disaster at Springhill Mines and a newspaper excerpt. By 1874 the McKinnons had settled in Springhill, Nova Scotia — a former coalmining community that is today remembered for its multiple mining disasters. Angus Archibald worked his way up through the mines and by 1884 had become the station master for the Cumberland Railway and Coal Company. On June 22, 1899, he married Sophia McConnell of nearby River John. The 1989 book Springhill: Our Goodly Heritage notes that he also became a town councillor and the mayor of Springhill. The deaths of John and Uncle Lauchlin were devastating to the family. Late one night, arriving home after extra station duty, Angus mentioned that he was tired, opened a newspaper, and, as Sophia retrieved his glass of water, died in uniform. The United Brotherhood of Railway Employees later laid a “broken-wheel” tribute in his memory. His eldest son, Harold, would continue the family tradition, working as a mechanical superintendent for the Cumberland Railway and Coal Company. I spent the 1970s entranced by Uncle Harold’s stories. Uncle Harold and Aunt Emma (née Ward) became my surrogate grandparents after my Nana, Harold’s sister Emma Catherine, died in 1969 — each having held their railway contributions near to heart. Learning about my family’s railway history has taken me on a journey of discovery into Canada’s past and has provided me a richer appreciation of all the railway men and women who worked so hard to help to tie this confederation together. Thank you one and all. The article originally appeared in the June-July 2018 issue of Canada’s History magazine.